Most innovative, smart and successful design, the wide opening of the Widepac makes filling cleaning and draining the hydration pack easier than ever. It's 100% leakproof and taste-free: Water from a SOURCE Widepac tastes like pure water. Choose one of three reservoir volumes. FREE Worldwide Shipping from $65 order value! Choose one of three reservoir volumes (1.5L/50oz, 2L/70oz, 3L/100oz) according to your needs. 18.5cm x 32cm x 6cm (max), 165g, Drinking Tube length: 94 cm. 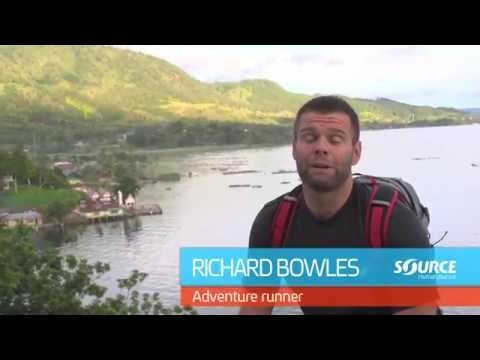 Richard is now out around lake Toba. he's meeting the locals and enjoying the scenery. When he finally sits down to explain what he likes so much about the Source Widepac, the Volcano erupts behind him! But an erupting volcano is not going to stop Richard from running - in it's direction!
" For the experienced outdoors-person and beginner alike... "
" The product worked well and held up to abuses..."